CWTS Article of the Month! Henry Varwig was born November 30, 1835 in Hannover, Germany to Joseph Henry and Maria (Brenkman) Varwig. Henry's mother died when he was three years old and his father brought young Henry with him to Cincinnati in 1841. Henry's father went into the brick-making and later grocery business at the corner of Linn and Findlay while Henry attended school. At the age of eighteen, Henry became a bookkeeper for his Uncle Bernard's clothing store at the corner of Court and Main. Three years later, Henry went into business for himself as a retail grocer on Findlay Street. He married Emily S. Brenner, the daughter of John C. and Ida Antoinette (Aehle) Brenner on November 9, 1858. They would go on to have two sons and two daughters. In the 1860 city directory, Henry is found in the meat business at the corner of 8th and W. Row (later to be called Central Avenue). In the 1861 city directory he is working as a tinner. Somewhere around late 1861 or early 1862, Henry found his calling in the bakery business. In 1862, his bakery is listed at 149 W. Court. In 1863 and 1864 his bakery is listed at 151 W. Court as listed on OH165GD-1a, his only store card. Henry is listed at 47 and 49 Elm in 1865 and from 1866 to at least 1881 at 421 and 423 W. Court. Henry Varwig was a very successful businessman and at one time held a contract amounting to $270,000 for three million pounds of bread for the army and navy. His bakery was capable of converting two hundred barrels of flour into eight hundred boxes of hard tack per day. At the same time, his bakery produced crackers for sale in Cincinnati. 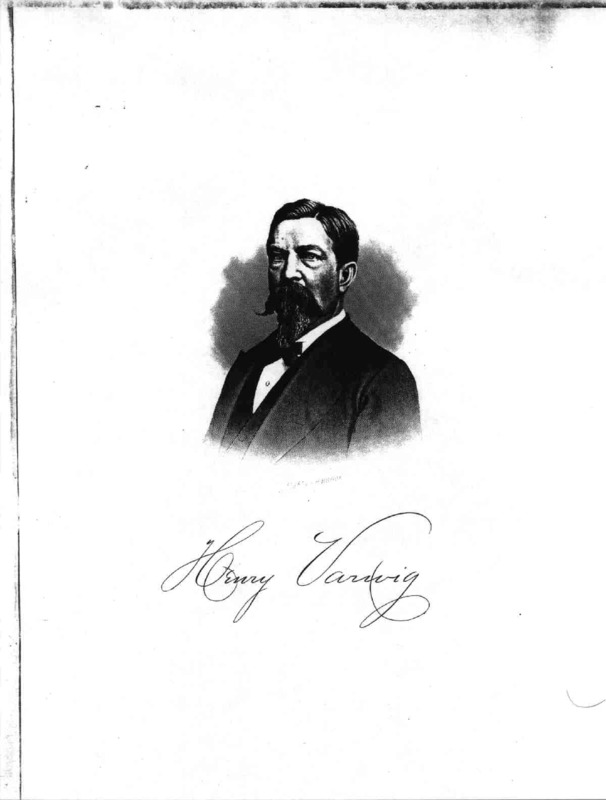 Between 1866 and 1868, Varwig operated the business as Henry Varwig & Co. which included G.A. and Reuben Brenner, probably his brothers in law. Sometime around 1870, Varwig converted his factory into one that manufactured self-ventilating beer faucets, a devise he invented and patented. Apparently, this was a very popular invention and one that made Henry Varwig a wealthy man. Varwig served as an alderman for at least two terms in the late 1870s and early 1880s. I could not determine Varwig's date of death; however, census records show that he died sometime between 1900 & 1910. Of course he attained a certain measure of immortality through the issuance of his Civil War store card. The OH165GD-1a token is undated and was struck by John Stanton employing a thin brass planchet and the John Stanton reverse reminiscent of sutler tokens. Although undated, we can determine through the city directories that this token was definitely struck during the Civil War. History of Cincinnati, Compiled by Henry A. Ford, A.M. and Mrs. Kate B. Ford, W.W. Williams Printing House, Cleveland, Ohio, 1881. History of Cincinnati and Hamilton County, Ohio; Their Past and Present, S.B. Nelson & Co., Cincinnati, Ohio, 1894. 1900 & 1910 Hamilton County, Ohio census records. May 1999 George McClellan - The Peace Maker? Articles reprinted with permission of The Civil War Token Society.